As the name suggests, Telemarketing Fraud charges are the result of people using a telephone to attempt to defraud other people or entities. Any fraudulent campaign to induce purchases through the use of a phone. For federal charges to be filed, the fraudulent calls must be interstate telephone calls. Most people, when quizzed about Telemarketers, think of lots of people and lots of phones in “boiler rooms.” So-called “boiler room” operations involve rented offices with lots of telephones operated by high-pressure salespersons who peddle charity solicitations, amazing investment offers, and other common scams. Law enforcement agencies are more and more savvy and more aggressive in putting pressure on such operations as they investigate complaints so as to build a case for prosecution. 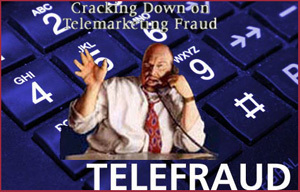 Fraudulent Telemarketers, in response, have increasingly engaged in more sophisticated operations whereby they have their sales-persons tele-commute from homes, motel rooms, motor homes, using cell phones, pay phones with pre-paid cards, VOIP phones connected via “Open Wireless Modems” — high-speed Internet connections “borrowed” from unsuspecting residents and businesses found on any block in Southern California County: thus no hard-wired phones, no paper trail, no offices, no permanent anchors to a specific physical location. Fraudulent telemarketers try to make their product or service of great value, or supporting a good cause – such as police or fireman’s balls, charities and so forth. If you are facing potential telemarketing fraud charges, it is critical that you use an experienced white collar criminal attorney with years of experience dealing with and defending against significant criminal charges from the State of California or even the federal government. Call White Collar Crime Attorney Vincent W. Davis to speak personally about your specific circumstances and get the answers you need right now. You are always better served to seek legal advice early where someone working on your behalf might be able to get the mess stopped in its tracks. Many times, a competent white collar crime lawyer, can get investigations stopped, charges dismissed or reduced, or help you get build a smart strategy that will ensure you the best possible outcome.